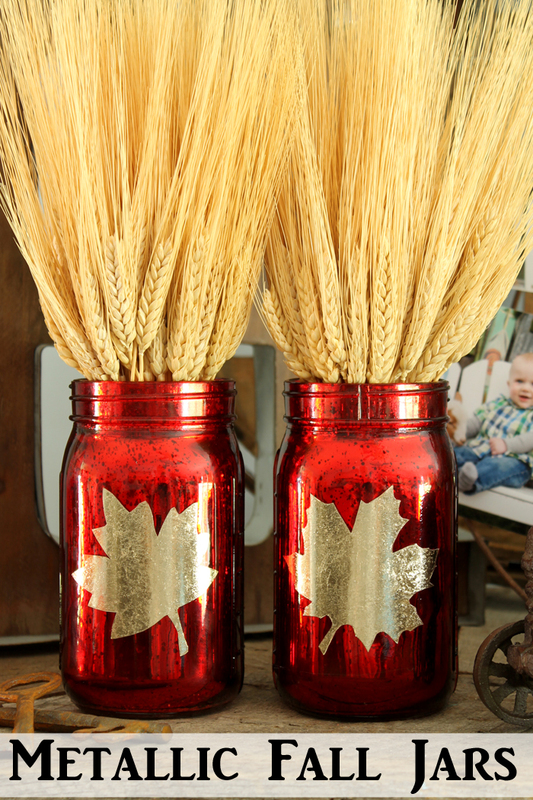 These metallic fall jars are perfect for your fall decor. They are easy to make with adhesive foils that can be cut into any shape. 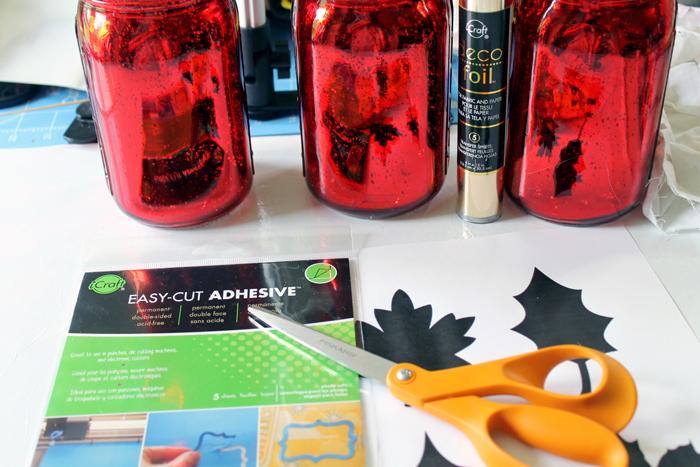 Use my free printable leaf template to make jars just like those shown or use your imagination and change them up to any shape. Either way the metallic is sure to shine on this gorgeous craft project. Be sure to scroll to the bottom of this post to see the other fall jar craft ideas as well. If you have missed any of the fun this week, be sure to check out the posts from day 1 and day 2. I am in love with these Deco Foils! 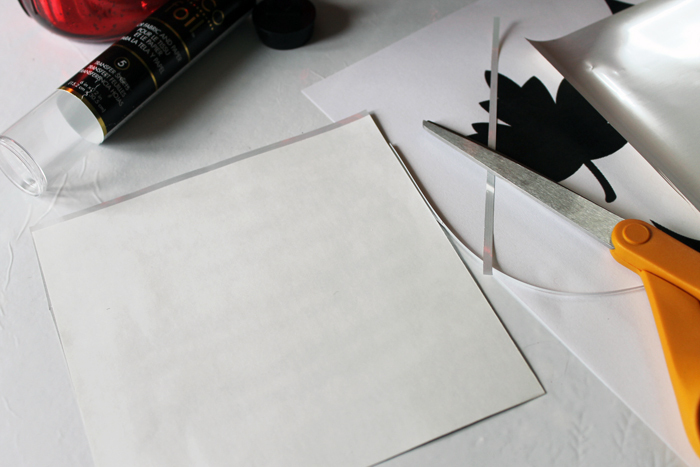 Take a piece of the easy cut adhesive and apply a piece of the foil to one side. Remove any air bubbles. 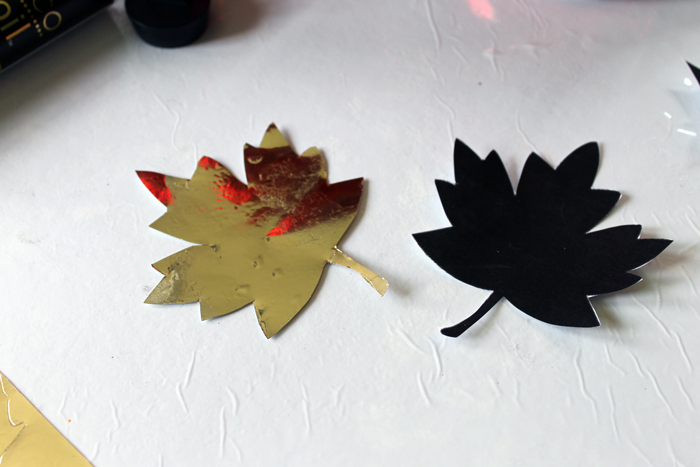 Cut a leaf shape from the leaf template. 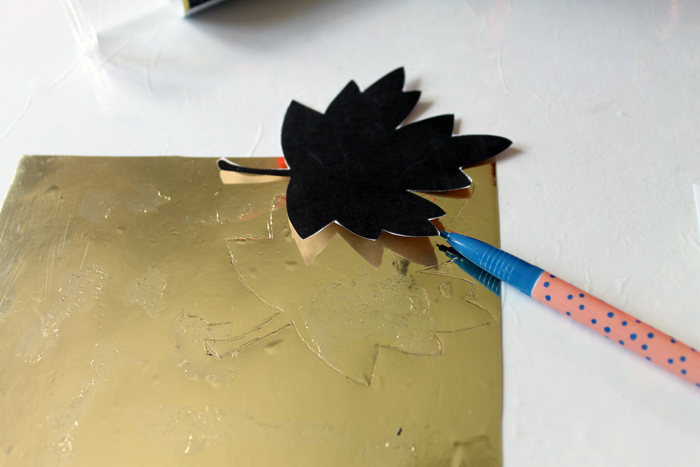 Trace the leaf onto the foil using a pencil. 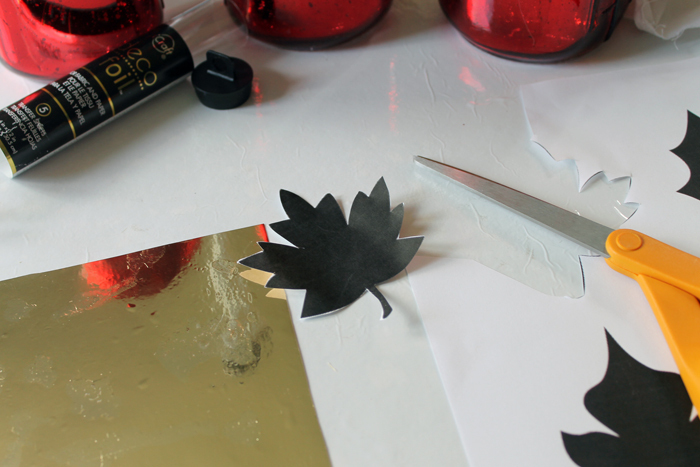 Cut the leaf from the foil using a pair of scissors. Now you basically have a foil sticker. Peel the backing from the foil and apply to your mason jar in the location desired. Press well to remove any air bubbles. Add these metallic fall jars to your home decor. 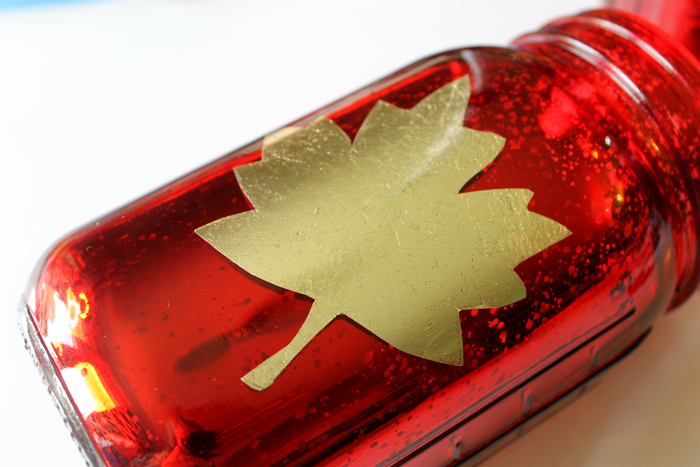 I love the red mercury glass in combination with the gold foil. They are the perfect addition to any home. 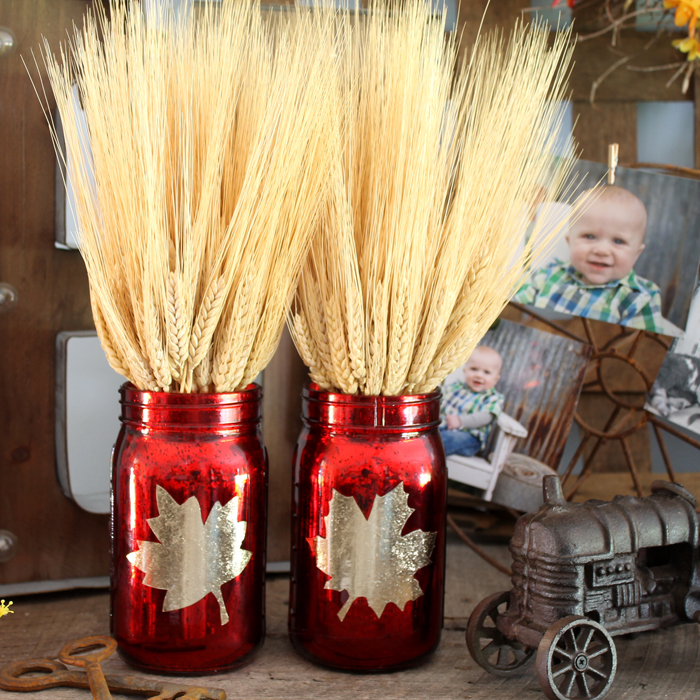 I added some wheat to each one but you can also choose fall flowers to go in your metallic fall jars. I promised you some more ideas for fall jars for you this week! Click on the links below to see fall jar crafts from my partners for this series. So very perfect for Fall tables to spruce up with style and bright colors. Did you buy jars at JoAnns? Also where did you buy foil and adhesive? Would love to make these, maybe put out on front porch or in house on shutter shelf. Love colors, maybe get 2 different colors for some variety and some wheat for jars. Hopefully can use coupons to help defray costs of supplies. Do you have holiday weekend plans? Enjoy whatever you do. Never seems to fail here, summer holidays we have winds and rain, feel bad for people who go camping. As far as I know, the jars are only available on Consumer Crafts. I have them linked above. They were actually wedding leftovers for me! The foil and adhesive are linked above as well. Good luck! And weekend plans? NO! Usually on labor day fall farm chores are in full swing! Wow! These are simply stunning! What a beautiful way to dress your home for fall. Thanks so much for this awesome idea! It turned out perfect! I love using deco foil. Pretty! & Perfect for fall. Thanks for sharing at this week’s Inspiration Spotlight party. See you again soon. Pinned & shared. These are super gorgeous! What a great idea for fall decor! Thanks for sharing these at the #SmallVictoriesSundayLinkup! These look great. 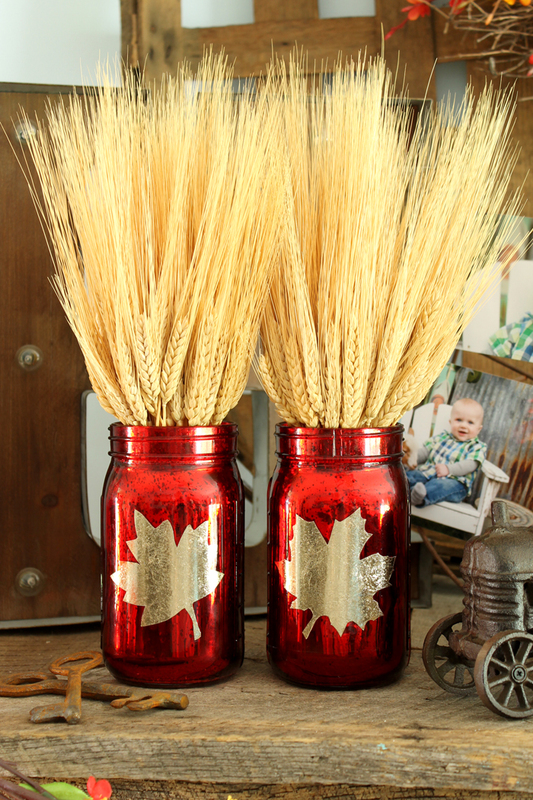 Thanks for sharing a new idea for mason jars and providing the link to the products. These are awesome and I love deco foil too. I love the red mercury glass! It really pops with the wheat and gold foil. Thank you for sharing at Merry Monday! I really liked this idea. All things metallic warm my heart. I featured this project on A Little Bird Told Me this week. Nice job!